It’s a green, green world: Teaching plant structure and function. The lecture course follows the increasing complexity and key innovations of plants in an evolutionary and life-history framework emphasizing, in particular, the water–to-land transition. Topics are presented in two–week blocks addressing plant structures (eg, leaves, vasculature) in the first week and exploring how they work (eg, photosynthesis, water and nutrient transport) in the second. By using an evolutionary framework, students discover why certain groups of plants have become especially successful in certain ecosystems. By integrating anatomy and physiology lectures, we have found that students develop a much stronger appreciation of the links between plant structure and function and develop a deeper knowledge of how plants work. In the final four weeks of the unit the students apply the basic building blocks of plant structure and function to explore questions related to the life histories of plants. Figure 1. 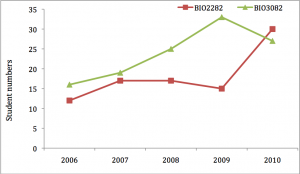 Unit evaluation data for BIO2282 in years 2007-9 inclusive. N.B. the question relating to assessment tasks was not available in 2007-8 data. The practical component of our unit builds on, and extends, the integrated lecture structure. To engage students in plant sciences we believe three basic requirements exist. First, the students must grow plants. Second, they must see (and measure) how the same plant species responds differently to different growing conditions. Third, they must understand (and use) the basic analytical tools required to describe these differences. To this end, we have developed a semester–long sequence of practicals in which the students grow two native Australian plant species across a range of water and light availability. The practicals are conducted in two–week blocks, in which the first week is devoted to sampling and measuring anatomical, morphological, and physiological features of the plants and the second week focuses on the data management, statistical analysis, and report writing. The experiment is a replicated, fully factorial, multi-level design, which allows us to introduce the students to increasing levels of complexity in experimental design, data analyses, and botanical techniques over the course of the semester. The early practicals focus on simple two–level comparisons with t-tests, whereas the later practicals use multi–factor ANOVA to examine interactions of water, light, and species on plant growth. This stepped approach to experimental and analytical complexity allows the students to develop the necessary skills for understanding and interpreting data of considerable complexity over the course of the semester. Figure 2. 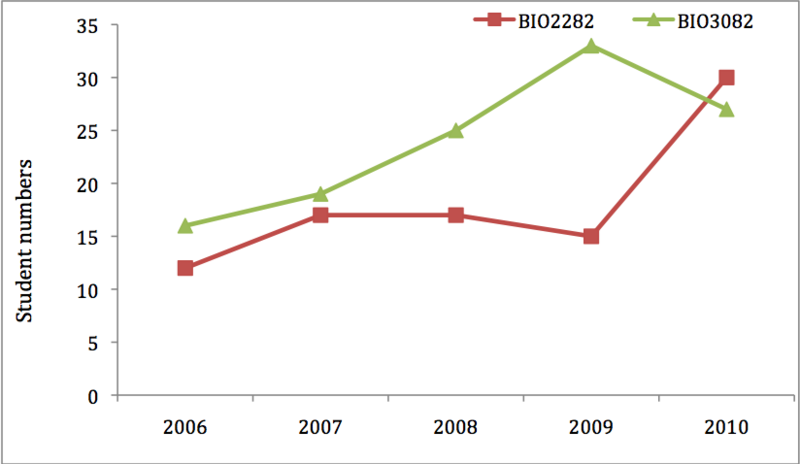 Student numbers in BIO2282 and the following unit BIO3082 in years 2007-10 inclusive. N.B. 2010 numbers based on current enrollments. A major theme in this unit is the importance of effective communication. We have developed an essay assessment that asks the students to explain in layman’s terms why various physical relationships expressed in mathematical equations (e.g., E=mc2) are important to life on earth in a botanical context. We then use a double–blind peer–review process in which students review each others essays, providing them with opportunities to read similar essays (but on a different equation from their own essay) critically with the goal of providing constructive feedback to their peers. Many students find this quite confronting, as they have never read other students’ work, but discover that it helps them to view their own work from a different perspective. Each student also receives at least one review from the teaching staff. The students are then given the opportunity to revise the essay prior to final submission and formal assessment. The best evidence of success is the extraordinarily positive unit evaluations we have received in this unit in recent years, and a doubling in enrollments in 2010 (see Figs 1 and 2, Table 1). We have also seen a significant increase in student numbers in higher-level botany units, and the honours program in the School. What were the best aspects of the unit? Table 1. Examples of student feedback from end–of–semester unit evaluations. Being able to peer–review essays and having ours reviewed also was helpful. The essay was really interesting. I was doubtful at the start but I thought it was a really good topic to research. I also liked the peer review bit, it was really helpful. I also liked having the mid-semester exam. The progressive analysis of the two plant populations grown under different treatments was good because it gave a chance to analyse long-term effects, and wasn’t as disjointed as other practical programmes. The idea of an essay review helped a great deal in the writing and structure of individual reports. The introduction to different statistical analyses garnered familiarity with the maths involved. All the attention given to improving writing skills was really helpful. Reviews of essays provided a good means to fine tune essays. I found the lectures and pracs interesting, I learnt a lot about data analysis and report and essay writing which are useful skills. I liked the experimental focus of the pracs and overall liked the unit and was motivated to pursue further study of botany at third year. The essay – it was different to all other essays that I’ve written at Uni (having to explain something complex in laymans’ terms). It was a good exercise. The teaching staff were great. Really approachable. The best part of the course was the long continuous study using the plants in the green houses. The organisation of the essay assessment meant that I found it very rewarding. Having students write a draft essay and receive feedback from staff and fellow students was very useful. The essay task not only improved my scientific knowledge, but my writing ability also (especially scientific writing ability). The teaching staff in this unit are amazing, and I’m very grateful for the amount of care and effort they have put into this unit. I felt like I was learning ‘real world’ skills with the assessment tasks, and I was encouraged to use my brain properly all the way through. The pracs and report writing. I think these are a great way to learn and hone techniques.